Trump has nominated current CIA Director Mike Pompeo to replace Rex Tillerson as Secretary of State, and current CIA Deputy Director Gina Haspel to replace Pompeo. Pompeo has overseen drone killings, torture, and the whole array of unaccountable CIA activities. He has openly advocated for the bombing, and overthrowing the government, of Iran. Pompeo is clearly eager to head off the threat of peace in Korea. Haspel is best known for directly overseeing brutal torture, and making sadistic comments to her victims. 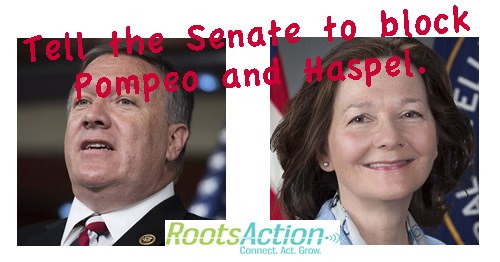 As a constituent, I urge you to block confirmation of Pompeo and Haspel.